The Gerudo: A Biologist’s Worst Nightmare? Nintendo is always very creative when it comes to Zelda races. We all know Nintendo doesn’t need to use biology facts to explain their creations, but still it is fun to figure out if a Zelda race could be possible in the real world. 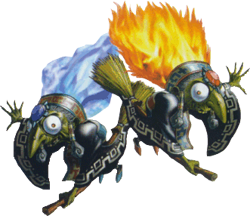 I already tried to explain the Gorons and the Zoras, but if there is one aspect about the Zelda series that can make a biologist go insane, it definitely has to be the Gerudo. The Gerudo are band of female thieves who live in a fortress on the edge of the Gerudo desert. Sounds simple enough, until you realize that almost all the Gerudo have identical features like red hair and tanned skin. This high similarity between individuals can only be explained by heritability, meaning that the main Gerudo traits have a genetic origin and are passed to the next generations. Then there is the Gerudo male (in most games represented by Ganondorf). According to Ocarina of Time, where the Gerudo first showed up as one of the races of Hyrule, Nabooru says that only one male Gerudo is born every 100 years. This weird life style confused me for years, because the more I think about it, the more I realize that a female-only society cannot survive in the human world. So are the Gerudo impossible humans or is there another way to solve the mystery of the female-only thieves? I didn’t use the pirates in MM for my theory, because I don’t think they are related to the Gerudo of OoT. Not only are Termina and Hyrule different dimensions, I can’t remember that the pirates talked about a male leader (I only played MM once, so I might be wrong). Are Gerudo really humans like us? Most articles about Gerudo compare the race to two other races found in Hyrule, namely the humans and Hylians. Since Gerudo have a human-like form and act like humans, it is not so weird to think that they are a human species. However, as we all know, humans are sexually reproducing organisms with male and female individuals. Gerudo on the other hand are only female individuals and an occasional man every 100 years. Therefore, I want to introduce another form of reproduction that can make the Gerudo society more plausible than we think, called unisexual reproduction. Unisexual reproduction means that a species consisting of females use the sperm of males from a closely related species for reproduction, but there is no genetic recombination of the paternal and maternal genes. So basically a female borrows the male sperm to use in reproduction, but it doesn’t use the genetic information. There are two forms of unisexual reproduction. In gynogenesis, females produce diploid eggs (contains two pairs of a chromosome, compare it with a normal human cell) but they need sperm to trigger the embryonic development. In hybridogenesis, the females produce haploid eggs (contains one pair of chromosome, compare it with a human sperm/egg cell), which are fertilized by the male sperm. No recombination occurs and only the female genes are inherited by the next generation, so only the maternal genome reaches the generation of the grandchildren . The basics sound quite simple, but are they useable for the Gerudo? Before we can start explaining how our one and only male Gerudo Ganondorf can even exist in a female-only population, let us kick him out of the equation for a while. For unisexual reproduction to work, we need two basic things: genetically identical females and males from a closely related species. If you see the Gerudo tribe in the Ocarina of Time, you notice that they look very similar. They all have long red hair, tanned skin and a skinny physique. This can be explained by the fact they reproduce unisexually, so the standard Gerudo genome is not recombined a lot expect for accidental mutations. The environmental factors can also explain why some Gerudo look a bit different. For example, the Gerudo guard Link fights in the Gerudo fortress is stronger than the regular patrolling guards. This is because she got a more intensive training to become a higher rank guard. The males from a closely related species aren’t that difficult to find in Hyrule. Castle town and Kakariko village are filled with good male candidates. Both the Gerudo and the human/Hylian males can travel freely throughout Hyrule so they can easily meet each other. The Gerudo rudeness towards males (as the four carpenter brothers found out) can be explained by the fact that the Gerudo are not the same species as humans. Humans can reproduce during every season of the year, but maybe the Gerudo only have one specific season where they travel out of the desert to look for males (and steal some treasures from the villagers during this search). Therefore, unisexual reproduction is possible in the Gerudo species. The typical Gerudo genes stay intact, but they do need males to successfully reproduce. Mr. Ganondorf is one of the best villains, but he makes the Gerudo tribe one of the strangest races in the Zelda series. To make at least some sense of my theory, I have no other choice than to speculate and to give ‘what if’ scenarios. Like I said in my introduction, the Zelda series is a fantasy video game and Nintendo doesn’t have to use biology facts in their creations. I still want to try to make some sense of my theory though, so let’s start with the ‘what if…’ scenarios. In the unisexual reproduction strategy, there are no males, but what if something went wrong during the embryonic development? Nature is not 100% error proof, so there can be a possibility that the male genes managed to recombine with the female Gerudo genome. A male hybrid is born, with the typical Gerudo traits but also the typical male traits from a human/Hylian. Still, the chance that a recombination like that happens is so rare that there is no way that it happens every 100 years, but who says that this Gerudo legend is true? I never saw any other reference about Gerudo kings in any Zelda game. I replayed Ocarina of Time recently and only Nabooru says something about this legend, but how does she know that it is true? She does not look over 100 years old to me. Thinking of that, the only two people that are over 100 years old and should know if the legend is true are Koume and Kotake, the two witches who took care of Ganondorf and are his loyal minions. But even Koume and Kotake never talk about the Gerudo kings from the past. What if they made up the legend for their own benefit? Since they are the caretakers of Ganondorf, they would gain a lot of power if Ganondorf would become the king of Gerudo. They used the fact that Ganondorf is a male to their own advantage and since they are at least 380 years old, they can easily claim that they knew the other Gerudo males while the other Gerudo are simply not old enough to know a Gerudo male other than Ganondorf. During the Zelda series, there has never been any other male Gerudo other than Ganondorf even though more than 100 years have passed between the games. This is a lot of speculating though and I cannot really prove that it is the truth. The Gerudo will remain one of the Zelda mysteries. It is a shame that the Gerudo only appeared in a few Zelda games. Maybe Nintendo also thought this Gerudo male legend would eventually mess up in Zelda games that appear centuries after Ocarina of Time, simply because then there would be even more Ganondorf like males who want to conquer the world. It is fun to think a bit out of the box and see the Gerudo as beings that are not as similar as humans as they look. I would like to know what you think about the Gerudo. Do you also think that the Gerudo reproduce unisexually and that the legend of the Gerudo male that is born every 100 years is false, or do you have another interesting Gerudo theory including the MM pirates that you want to share? Let me know in the comments.